Vienna is famous for its many masterpieces … Sacher Torte, the Spanish Riding School (you know me and horses), its many beautiful palaces and, of course, music. Everywhere you walk sandwich boards are perched on sidewalks advertising nightly classical performances in concert halls and churches across the city. These concerts feature the music of Vienna’s (and other) great composers, including but not limited to Mozart, Bruckner, Schumann, Lehar, and Haydn. 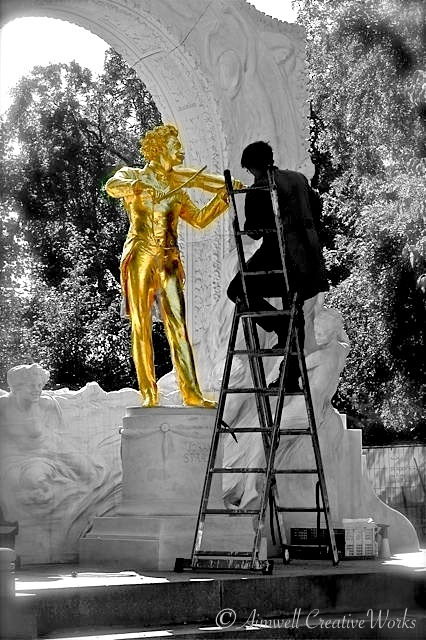 Perhaps the golden boy of Vienna composers was Johann Strauss II ~ composer of the Blue Danube Waltz, among other instrumental gems, and my favourite operetta ~ Die Fledermaus. A couple of years ago, while strolling through Vienna’s Stadtpark (which boasts a number of statues dedicated to Vienna’s masters of music) we ventured upon this incredible monument to Herr Strauss. At the time it was cordoned off for refurbishment. To get this shot I had to stand on a bench and peer over a solid barricade. At the time I was disappointed by the obstruction. Still, as I ponder this image now I wonder if the artist applying gold leaf, surrounded by his tools and perched precariously on a ladder, had any notion at all that he might be engaged with a masterpiece of his own. Regardless, it is a monument worthy of Vienna’s Master of the Waltz. This entry was posted in Art, Europe, Music, Photography, Shout Outs, Travel, Uncategorized, Weekly Photo Challenge, Writing and tagged Austria, Photography, postaday, Travel, Vienna. Bookmark the permalink. Awesome!! I really like this photo! I think it’s fabulous with the extra artist included! That’s really an interesting picture. Haven’t been to Vienna since the 70’s, but I still remember its beauty. I loved the Spanish Riding School and the beautiful horses.